What To Do While Buying a New Laptop !!! 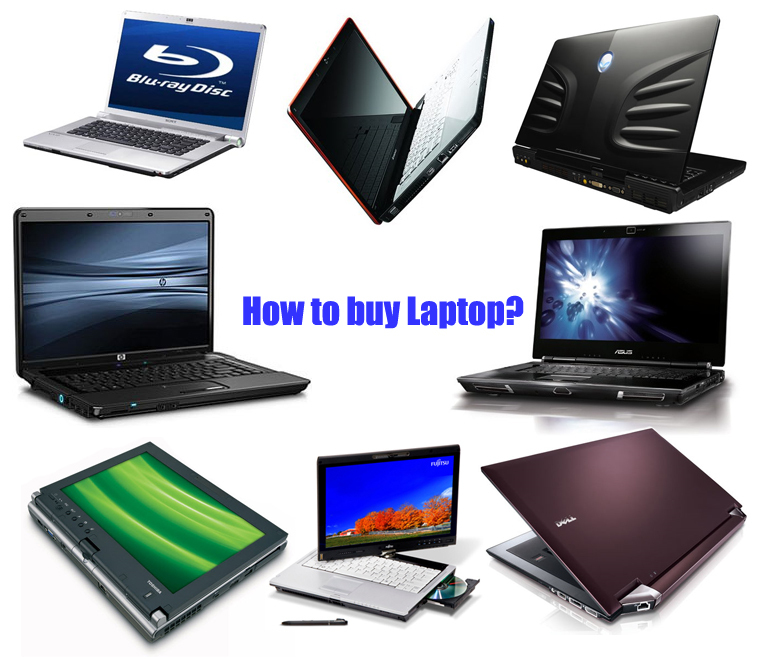 Do you want to know what to look for when you are shopping for a laptop? I ll gives you some basic tips on how to choose best one according to your investment. Most of us face a problem when we consider buying a laptop. The different variables involved like Processor, Ram, Hard Disk,Screen etc can get overwhelming, and confusing. So what should you consider when you’re shopping for a laptop? First and foremost, check the processor. The available options are Atom, Intel Dual Core, core 2 duo, i3, i5, i7, and the AMD series.Confused? Let us simplify. The processor speed is calculated in GHz. Simply speaking, the higher the GHz, the faster the speed. But that also means more power consumption, and a costlier laptop. Now should you go for the fastest processor?An easy thing to help you make that decision is to think about what you would be using the laptop for the most—if you’re using it just to type, watch movies and surf the Internet, you don’t really need a high end processor. If you are a software engineer or a film editor, then you might opt for a higher processor. The best processor for you would depend on the right combination of price, power consumption and your needs.The right processor today, for a student with a budget of more or less between 24 to 30 thousand rupees would be the i3 processor. Anyone with a lower budget should go in for the i.e. dual core. Netbooks or mini-laptops run on the Atom processor, andare cheaper, starting at around 13 thousand rupees. After the processor, you need to consider the laptop’s RAM.This relates to how many applications you can useat one particular time. Together with processor speed, this decides the speed and the effectiveness of the computer in handling multipleprocesses. Ideally, around 3 GBmemory is suitable. However, even a 1GB RAM netbook works fine for a student who wants to use it for basic assignments. Do not settle for anything below 250 GB. 500 GB would be ideal. Netbooks may have lower memories, but they also start at 250GB today. DIMENSIONSThe ideal weight for a laptop is up to 2 kgs, and the ideal screen size is 15 inches. Mini-laptops have screen sizes under 11 inches. These laptopshave a great advantage when it comes to portability, because they are light weight. Battery life is a very important in a place like Kashmir where power outages are frequent. 3 cell batteries are cheaper, but you could opt for 6 cell batteries, which give more time. Netbooks have the best battery life, usually above 4 hours. But with time, battery performance decreases. Check the battery life of the model before purchase. Most laptops come with a one year warranty period, but look for the models which come with extended warranties of 2-3 years. Also look for models which come with on-spot warranties. Go for a purchase only if the company has a complete service centre in the valley. Pre-installed systems which come with Windows are usually costlier than DOS or LINUX based machines with the same specifications. Specialised computer brands are always better than electronic companies which also make laptops.Most brands, MNC or Indian, mostly acquire either fully assembled laptops or most of the components from China or Taiwan. So, before shopping for a laptop, keep these points in mind. Do not go to the store, and then start thinking.Go only after deciding your specifications and after getting an estimate of the price from the internet. But after this, do not expect that you will get the laptop at the same price in the market. One more thing, go for the lowest price when two established companies have the same specification models at different prices. And also remember that the price in the market will always be a bit higher than the Internet, around 5-7 percent higher, but do not go for anything which is higher. When it comes to the laptop’s appearance, it is of course your personal taste that matters—just don’t compromise performance for the looks. One final advice. It’s better to go shopping in an area which has a cluster of computer stores. The competition is higher, and the prices will be towards the lower end. You have shared here good information in detail about when buying laptop.